Flight Lieutenant Arthur Weller was one of the pilots who took part in the early combats over the Western Desert and the desperate actions over Crete before being killed in a tragic flying accident on 13 December 1941. Peter Holloway, one of the contributors to this site, has now written a very interesting book about Weller, which I can highly recommend. 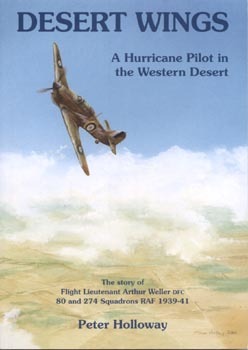 Through meticulous research and many first-hand testimonials, Peter Holloway gives us a unique insight into the lives of these pilots in the Western Desert. From the remorseless heat and sand of the desert to the cosmopolitan centre of Alexandria, he paints a compelling and poignant picture of these young men, on whom so much depended. Desert Wings tells of Weller抯 daring lone attack on enemy aircraft at Benina, Libya, for which he was awarded an immediate DFC, his ordeal by evacuation from Crete and the brief haven of his courtship and marriage. The story culminates in his tragic death at the age of just 23. The book has 304 pages and lots of pictures. The book costs � plus �50 postage UK and plus �airmail postage for the rest of the world. "The Desert was our Headquarters"
"Heraklion is Serviceable and in our Hands"
The book can be ordered direct from the author Peter Holloway.